There's a stretch of holidays between Mother's Day and Labor Day when a Bloody Mary perfectly completes the breakfast, brunch, lunch, or BBQ you are hosting. It's one of my favorite drinks to make and one that I take a lot of pride in. But sometimes you have to freshen things up a little...yes, even the old favorites. A few months ago I was craving a bit more of a bite in my Bloody Mary recipe and adding a radish infused vodka seemed like a great solution. I'd never planted my own radishes before and definitely haven't seen an organic radish vodka in the store (yet). Apparently these little veggies don't need much maintenance; just a small amount of soil, a few hours of sunlight, and some water. The stalks were towering above the ground just weeks after I nestled those little the seeds into the earth, giving me a huge amount of satisfaction. If only I had that much success with everything in our garden! 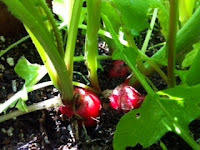 I peeked into the dirt a little to gage the size of the radishes and after about 5 weeks determined they were ready for plucking. They came right up out of the ground with no effort and gleamed a deep pink once hosed off. After a more thorough clean in the kitchen, I chopped off the roots and stem, cut them into thin slices, and dropped them into a jar full of vodka. Patiently, I waited as they "marinated" overnight. The wait was worth it because the spoonful of vodka that I sampled the next day was exactly what I was looking for. It had a zing to it without being overwhelming. In my freezer I now have a full jar of radish vodka ready for some Bloody Marys and a slew of weekend gatherings. Now I need to figure out all the other ways I can use it!